The craft arrived Longyearbyen on 2 June. Sabvabaa left Longyearbyen on 20 June on the first of five trips for the Norwegian IPY-project: Class room on ice funded by the Norwegian Research Council. The crew on each of these trips were two scientists and two high school students. All trips went well except #3 which was aborted before Ny-Ålesund due to propeller pitch control problems. The last student trip was completed 29 August. On each trip the craft went 2-5 nm. into the ice pack and parked for about 2 days for the students to carry out a series of geophysical and oceanographic measurements. The ice edge at the time of the first trip was touching the northern shores of West Spitsbergen and had receeded to 80.75 degrees N by the end of August. Following completion of the IPY- Class room on ice project, a sixt trip was made to deploy and further test a prototype autonomous seismic buoy. A first successful test had been completed on one of the student trips. Crew: Y. Kristoffersen and H. Berge, University of Bergen. The weather north of Spitsbergen turned too rough for transit to the ice edge and the craft returned to Longyearbyen after seeking shelter for 1.5 day in Frambukta. The seventh and last trip ( 4 -15 Sept.) was to carry out ice thickness measurement and test the autonomous seismic buoy. Crew: Y. Kristoffersen, Univ. of Bergen and C. Haas, University of Alberta, Edmonton, Canada. 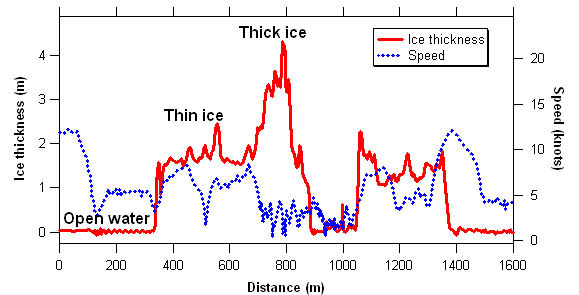 More than 200 line kilometer of ice thickness measurements were successfully completed. A number of ice thickness calibration checks were made by drilling a hole in the floe and CTD measurements were also carried out with a small hand operated winch. The seismic buoy was also tested. During the return journey, the wind speed increased on approach to Nordaustlandet and conditions for transit became marginal. It was necessary to seek temporary shelter in Mosselhamna (2 days) after crossing the Hinlopen Strait and again at Frambukta (2 days). During the final part of the trip a vibration developed and eventually forward propulsion was lost during an attempt to beach in Frambukta. 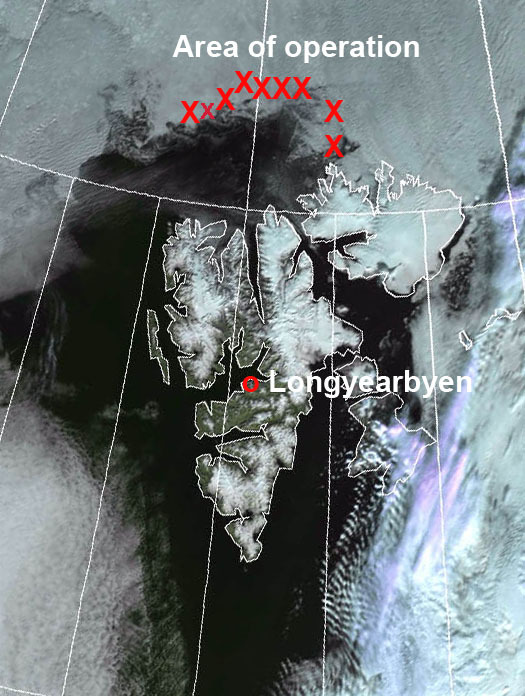 The craft was parked safely above the tidal zone and the two crew members returned to Longyearbyen onboard University of Bergen research vessel Håkon Mosby on 15 Sept. The craft was recovered by the freighter Norbjørn and arrived Longyearbyen two days later. For the 2008 operation a 12 drum fuel depot had been established in Bjørnhamna, and 8 drums were used on the last trip. Permission was granted by the Governor to carry over 4 drums to the 2009 season. All incidents which required forced landing on a beach outside Longyearbyen due to deteriorating weather conditions were reported to the Governor without delay. In total, Sabvabaa completed over 3.300 nautical miles during the first season. The craft performs at least as well as expected in pack ice. Pack ice fields may look messy, but usable passages can always be found with little delay. 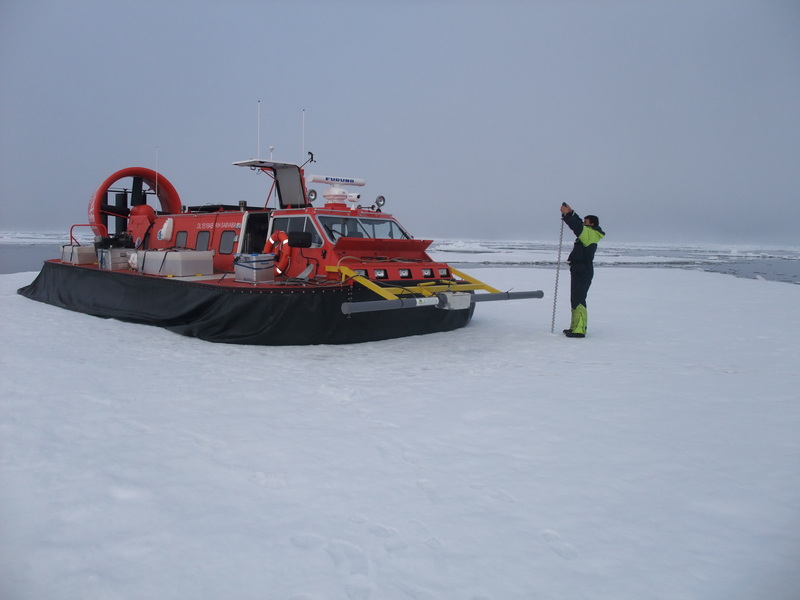 Sabvabaa moves with same the ease over thick ice as over thin ice, and the craft has proved to be useful for a variety of scientific tasks. It appears more efficient than any other platform for ice thickness measurements and oceanographic work, i.e ice melting/freezing processes in general. It is however, a small vessel and requires relatively good weather conditions for unsheltered open ocean passages. Future use of the craft jointly with an icebreaker expedition is expected to significantly increase the scientific efficiency of the total operation. Additional new equipment for the 2009 season are a SEACAT CTD probe and winch w/ 500 meter conducting cable and an Aandera Recording Current Meter. The expanded modular deep sea winch will have 3000 m kevlar (breaking strength > 2 ton). Weight of complete deep sea winch system is ca. 170 kilo.